Did I have enough skill and patience to stab a bunch of book pages onto a coat hanger? I flattered myself to think that I did, so I set about destroying a book to make my own Wendy-style wreath. Don't hate me, but I chose to use a book from the Chicken Soup for the Soul series to make my book wreath. I'm not anti-soul or anti-chicken; I just wanted a book with true white pages rather than pages that had yellowed. Plus, it was the only book in our "donate" box. As it turned out, the book was printed on paper that was more like heavy copy paper than the typical, "pulpy" paper used in most books, and when I folded the pages, they didn't fold gracefully like Wendy's had. 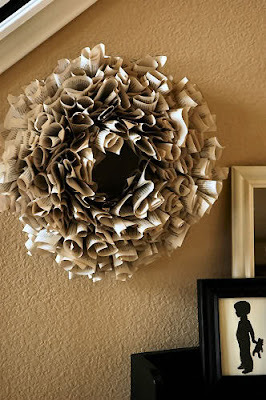 Instead the pages flattened, making my wreath look like a Rolodex, only homelier. I tried six or seven different paper folds, and each one failed more spectacularly than the last. 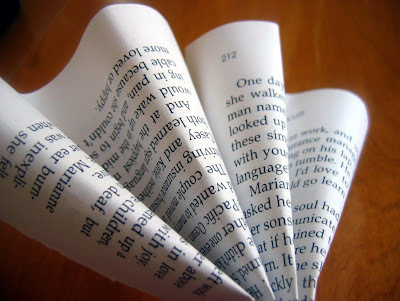 Observing my mounting pile of rejected folded book pages, my husband quipped, "Hey, here's an idea! Why don't you put all of those pages together and make a book?!" 2. Color the edges of the book pages with your marker. This doesn't have to be perfectly even--you're just adding a little contrast. I used a licorice-scented "Mr. Sketch" marker. The same type that I first used when I was in preschool. Yes, I own some truly sophisticated craft supplies. 7. Repeat the steps above until you have a full wreath! I chose to thread the "fans" onto the wire so that the "open" edges of the paper all faced down (underside pictured below) and the fans alternated left and right, but once the wreath was full, this little bit of compulsion made absolutely no difference, so you can just thread yours on any old way you like. The "fans" spin easily on the wire, so you can rearrange at any point: 8. The best part is arranging & fluffing up the paper fans once your wreath is nice and full. The pages make a nice rustling sound too, like a petticoat. Finally, I added a large button to the ribbon. It's hard to see in the photo, but the top layer of ribbon is cut into a point right below the button. Voila! The finished wreath! What do you think? I'm satisfied. Or, as my Italian grandma used to say after a good meal, "I'm sodispied." My favorite part is the fact that the papers kind of look like ribbon candy. Festive, in a kind of anti-literary way.